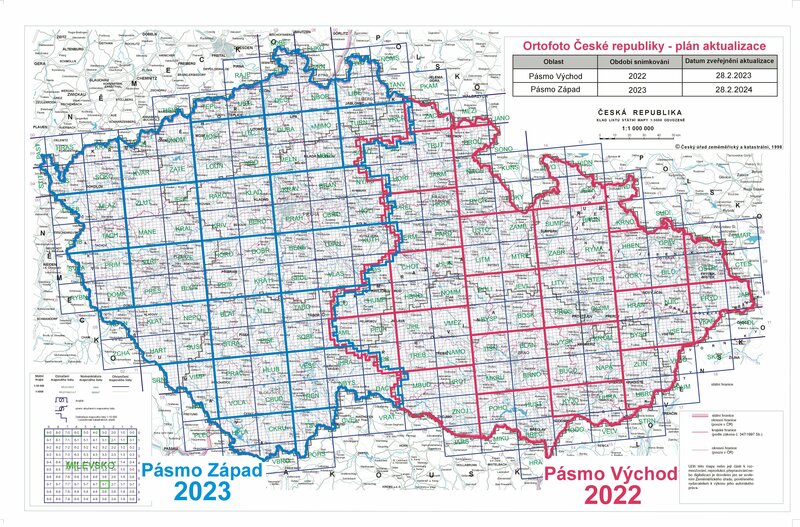 Orthophoto of the Czech Republic (Orthophoto CR) represents a periodically updated set of colour orthophotos of the dimensions and division into map sheets of the State map at 1 : 5,000 (2x2,5 km). Orthophoto is a geo-referenced orthophotographic display of the Earth surface. Orthophotos show the photographic image of the Earth surface transformed in the way that image shifts generated during acquisition of aerial images are removed. Orthophotos are colour-balanced, apparently seamless (seams are confined to natural lines). In frame of individual zones the orthophotos show images of the area acquired in the same year. Up to 2008 the Orthophoto CR was created with the pixel size 0.5m and since 2009 orthophotos already have a unified pixel size of 0.25m. Since 2016 orthophotos already have a unified pixel size of 0.20m. Since 2010 the photography has been carried out by digital camera, which has caused additional increase of product quality. Production of the state Orthophoto CR has been assured by the Land Survey Office in cooperation with the Military Geographic and Hydrometeorological Office (VGHMÚř) on the basis of the agreement between the Czech Office for Mapping, Surveying and Cadastre (CUZK) and the Ministry of Defence of the CR (MO) since 2003. Colour aerial photographs of one third of the Czech territory was taken along meridian zones (“West”, “Centre” and “East”) every year between 2003 and 2011. Since 2012 the aerial survey photographing of the territory of the Czech Republic has been changed to biennial period when every year app. a half of the Czech territory is processed. The actual state of the Orthophoto CR update can be found in the right menu of this page. Orthophoto CR is used by the Ministry of Agriculture domain as a basis for evaluation of the fundamental production units of the LPIS system. In the domain of CUZK and MO serves, among others, as a fundamental base for the update of topographic data and further state map series. Orthophoto CR is also provided to an array of other users and is intended above all for use by organisations and state institutions and local governments where it is used for planning and project preparation, environmental protection, risk management and other applications. Increasingly, Orthophoto CR finds its use as the base data layer in geographic information systems, map portals and web applications. Orthophoto CR is beneficial to combine with vector data, e.g. other data sets from the production of CUZK domain. Orthophoto CR serves as a background layer for all services enabling access to cadastre of real estates data (Viewing the CRE, DP, WS DP, WMS CRE). Orthophoto of the CR is provided in the form of data files; information on this product can be found in the right menu of this page. Orthophoto CR is available using map viewing services; more detailed information can be found in the Web services section. View services WMS and WMTS can be exploited free in all applications (clients). The map window at introduction page of Application section at the CUZK Geoportal or Geoviewer client can be exploited to display them. To order data you can use the internet shop.